Log sessions, view session reports, and more. Sessions is where to go if you'd like more information on a particular situation or if you need to log a session. Like in the example above, sessions are displayed in descending chronological order, so sessions that occurred most recently are at the top of the list and top of mind. In the list view, you'll see the Date the session took place, the Tutor and Client who had the session, and that tutor's earnings from that particular session. Session Rating and Session Reports. The tutor's earnings and the client's rate. *Note: Only admins have access to both the client rate and the tutor's earnings. 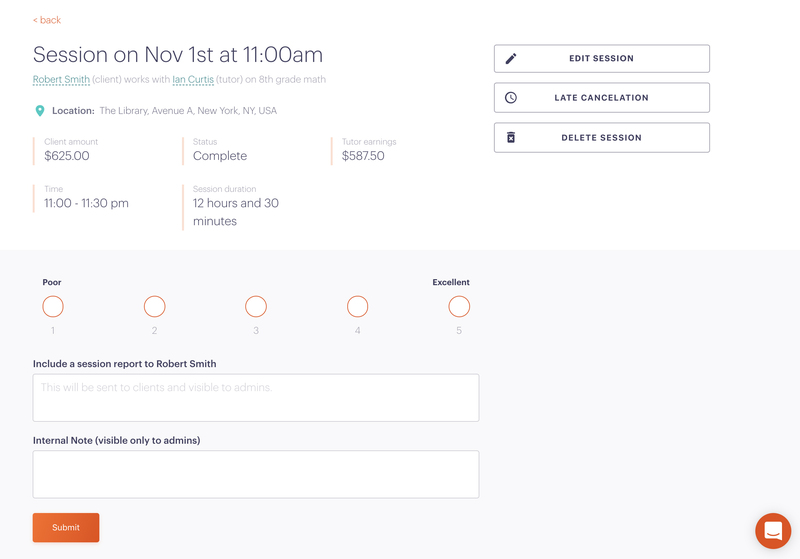 Tutors are able to see their earnings when they log a session but they will not be provided with the client's rate when logging a session. 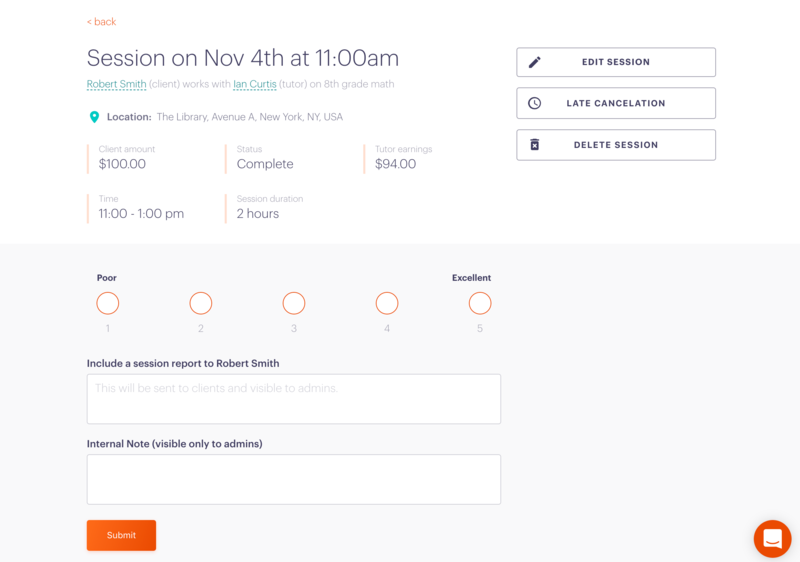 Administrators and tutors have the ability to log sessions. In order to send an invoice to a client you'll need to have at least one session to bill for. You can adjust the amount of sessions included in an invoice. 2. Once you select a Tutor in the dropdown menu at the top, a new dropdown menu with that tutor's engagements will appear directly below it. Choose the appropriate client and subject matter. 6. Double check that Tutor earnings and Client amount are correct (If they are not and you would like to adjust each rate you may do so by editing the engagement from the respective tutor or client's page). 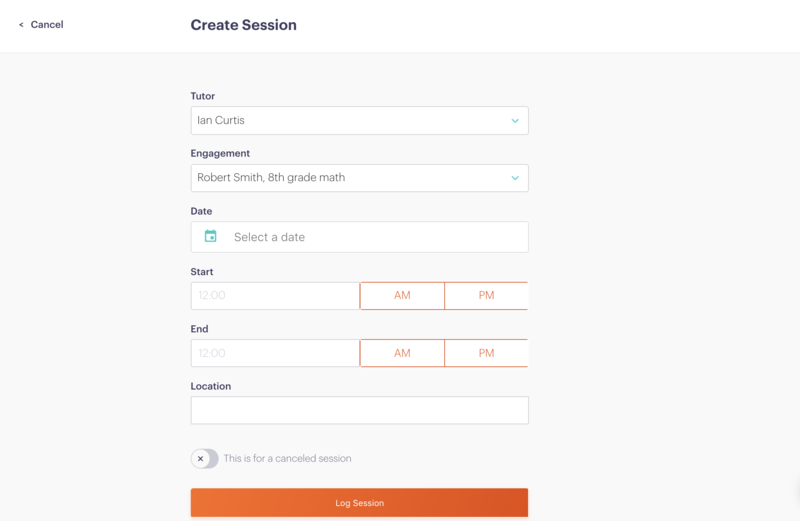 If you intended to cancel the session, but forgot, you can click the 'Late Cancellation' button in the top right corner, under 'Edit Session'. 7. If you would like, you can add a session rating, a session report (to be sent to your client's parent/guardian), and an internal note. 8. 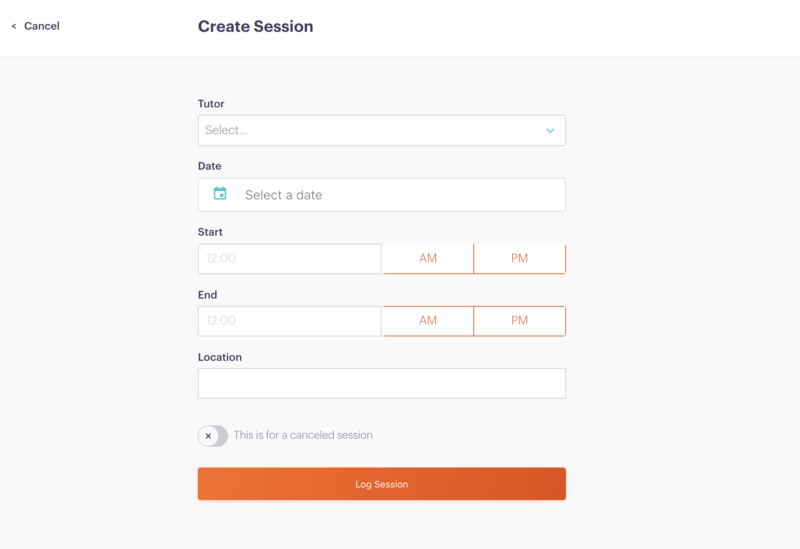 Select 'Submit' to complete logging the session. You can check out how to edit or delete a session here. *Note: You can skip this section entirely and add a rating, session report, and internal note at a later time. Additionally, once a session is logged, the session report is locked in and automatically sent to parents/guardians via email. Check out how your tutors log a session here.